#1. Select Pokémon in your Main Menu. #2. Select the individual Pokémon you would like to transfer. #3. Select the Dropdown list and Transfer will be an option. #4. Select Transfer and the following message will then appear: "You can't take it back after it's transferred to the Professor. 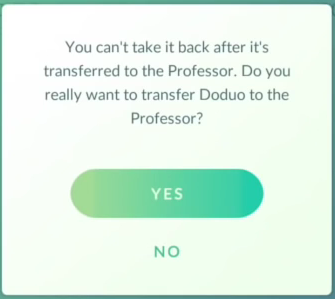 Do you really want to transfer "Pokémon Name" to the Professor? #1. Your Transferred Pokémon will be gone forever. #2. You will receive +1 Candy for the Pokémon you have Transferred. This feature is useful for getting rid of Pokémon you have a lot of (Eg. Pidgeys), especially because each player can only hold a limited number of Pokémon at any given time. If you have any Tips on transferring, feel free to share them in the comments below! See the Pokémon Go Glossary for more Pokémon Go Terms.